Will 2019 be sweet for sugar? Following a two month steady decline, ICE Sugar futures are showing some signs of support, and this time the reversal could extend to push the sweetener back to trading ranges not seen in the last two years. The spot contract (Mar19) chart puts sugar futures close to the 13 cent mark, and unlike other recent surges, there may be a catalyst that could support an extended run in higher territory. 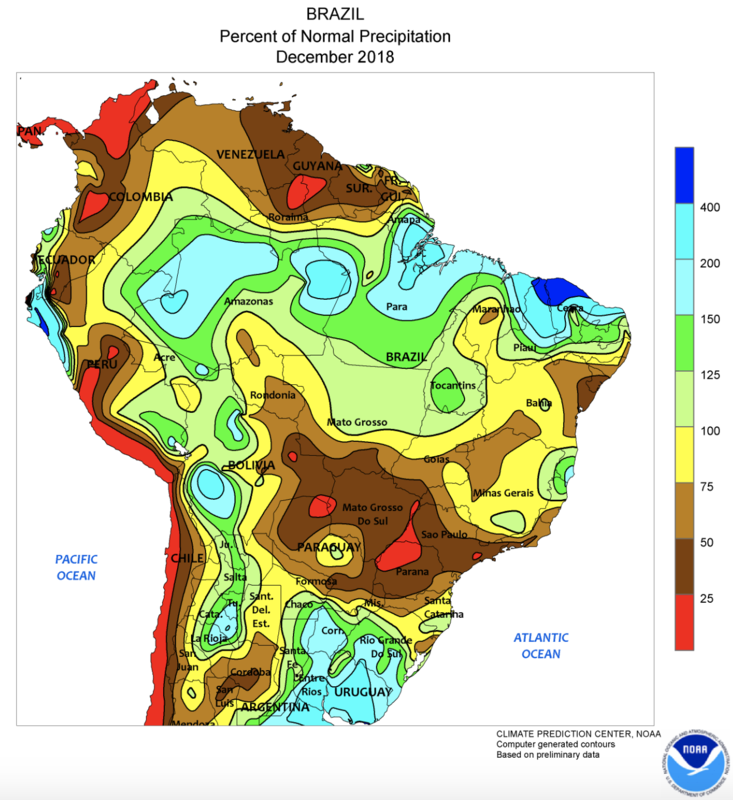 On the supply side, the lack of available moisture across the world’s two largest sugarcane origins should be a cause for concern regarding 2019/20 crop potential. 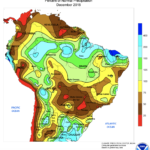 In Brazil, the Centre-South producing states (primarily SP/MGDS/PR) are seeing a signs of a drier summer start to strengthen and this is occurring at a particularly critical stage in the growing cycle for first-year cane. The majority of Brazil’s cane is grown 18 months between ratoon cuts, and new crop planting for the upcoming marketing year was completed in late Oct/early Nov. Similarly, in India’s two cane belts, a pronounced lack of rainfall is evident in the north and the south. Looking ahead, the pattern in India is even more concerning. The Climate Prediction Center issued their monthly ENSO update earlier this week, and although current development conditions are in the neutral range, the report states that there is a high probability for a weak positive-phase El Nino to develop through Northern Hemisphere spring, and this may be enough to trigger extended dryness in India and across all AsiaPacific origins. Positive-phase El Nino affects AsiaPacific moisture potential for sugarcane in two ways. First, there is a connection between El Nino and Indian Monsoon potential (El Nino +/Monsoon -). Second, as positive-phase ENSO evolves, zonal westerly winds intensify and move across the Pacific towards the Americas, bringing with them convective activity and the resultant moisture that would otherwise be available to cane origins in Australia, Thailand, and Southern China. Despite projections of record stocks for World Sugar, a supply glut can be easily erased if weather does not cooperate. In November, the USDA Foreign Agriculture Service placed estimates for a global sugar stockpile surplus of approximately 9mmt. This sounds like a healthy cushion, but a bad output year in a primary origin can send the supply-demand balance into deficit within one growing season. So while the market is focusing on a favorable supply scenario, the risk of a constructive pricing market in 2019 does exist. And while a potential price increase from 12 to 16 cents/pound does not sound like much, when we consider (a) volumes, (b) how many products for consumption contain sugar as a primary ingredient, and (c) the number of farmers globally that rely on the crop, the potential implications on global trade become apparent. Continue to visit this site for ongoing discussions pertaining the physical, technological and market components associated with the global commodity complex.